Well, folks, I was hoping to do some recording "in the field" for a podcast chronicling Movies At Dog Farm III, but logistics squashed that plan. Maybe next time. Instead, here are some notes and pics. 12:30 p.m. - I picked up an Epson video projector, a Yamaha sound projector, and a PSB subwoofer, all on loan for the weekend from my accommodating employer. I arrive at the Dog Farm about forty-five minutes later after a pleasant drive through some lovely Virginia countryside. I'm nervous as always, though at least I'm not battling a raging infection this time. I was very, very sick for the last Movies At Dog Farm. I couldn't find any Shock Top Raspberry Wheat for the weekend, though, so I have to make a substitution. I drink once a year, and my beer of choice has vanished from the face of the planet. I thought I had one left in my fridge at home, but my mother beat me to it. 1:30 p.m. - Upon arriving at the Dog Farm, I'm greeted by Phil Neff - our host for the weekend - and my buddy Herb Miller, who arrived the preceding evening. They're about to clear out the carport storage building, which has served as a what I'll politely describe as an archive of ephemera since the last Movies At Dog Farm event two Octobers ago. Herb and I decide that Phil has only concocted this event as a means to dispose of some unwanted clutter. I'm not complaining, though. In addition to some peculiar old signage, I came away from the excavation with a couple of Super 8mm film reels - Bride Of Frankenstein (1935) in a proper film tin and When Dinosaurs Ruled The Earth (1970) in an illustrated cardboard box. 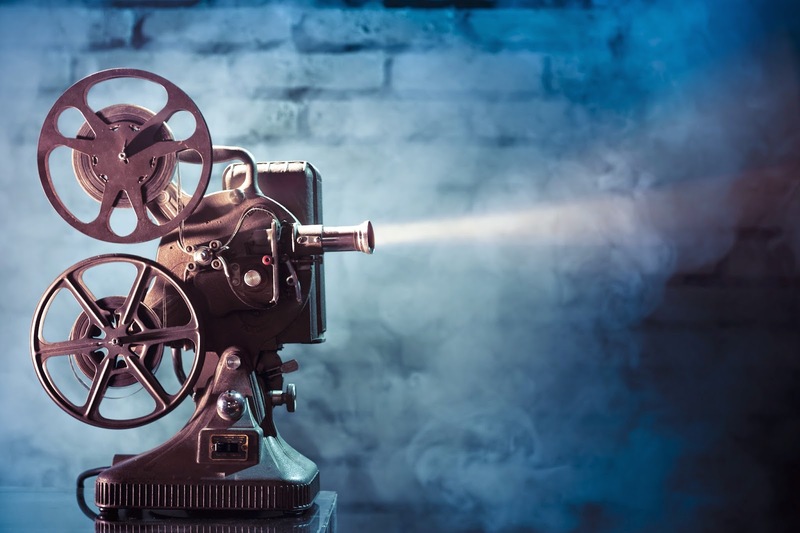 Now I have to acquire a Super 8mm film projector, but I'm pretty stoked about experiencing these old flicks in about the only way movie aficionados could in their homes prior to the advent of VHS. 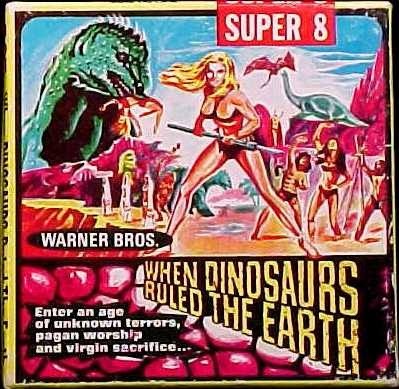 When Dinosaurs Ruled The Earth Super 8 film reel box. I initially want to move the projection screen and equipment outside, but I note that several of the guests who've arrived over the course of the afternoon are already donning sweatshirts and jackets even before the sun goes down. It's a beautiful day, but it's breezy and cooler out in the woods than in town. We opt to keep the screen indoors rather than have everyone too uncomfortable to enjoy the movies. I do, however, continue to harbor the notion that we'll move things outdoors tomorrow for Beyond The Valley Of The Dolls (1970) and The Sentinel (1977). 8:30 p.m. - SHOWTIME! Sadly, Herb and I are driving around greater metropolitan Timberville looking for the pizzas we were sent to pick up for the guests back at the Dog Farm. The collective brain trust failed to ask where the order was placed. Who woulda guessed such a tiny little speck on the map would have four pizza places? 9:15 p.m. - Herb and I make it back with the pizzas, and the movies commence less than an hour behind schedule. Starship Troopers (1997) is first up, and the UK Blu-Ray I ordered looks and sounds fantastic. It seems to be well received. Most of the guests hang in there throughout the run of the movie, though we lose a couple to travel fatigue. 11:30 p.m. - Movie #2 begins - Saturn 3 (1980). This is also a brand spanking new Blu-Ray copy, which looks and sounds far better than the previous no frills DVD release. Those of us who didn't crash prior to the start of the second movie make it all the way through. There will not, however, be an "After Midnight" selection this evening. Tomorrow is another day. So over all, things go swimmingly on the first day of Movies At Dog Farm III. Day two promises to be even better.